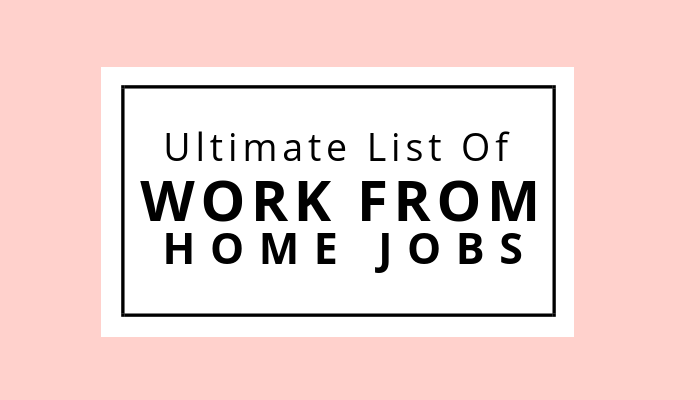 Work from home jobs have become more popular in recent years – so much so that 4.9 billion people have made websites and articles about it, according to Google. More and more people are trying to find nontraditional ways to break away from their regular 9 to 5 and make a living by different means. 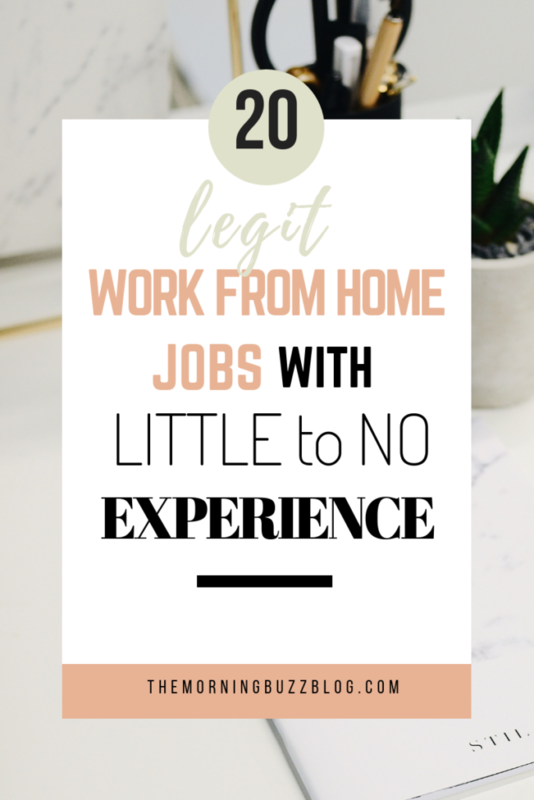 There are many benefits of working from home, but among the most common are being able to set your own schedule, work flexible hours and travel full-time. 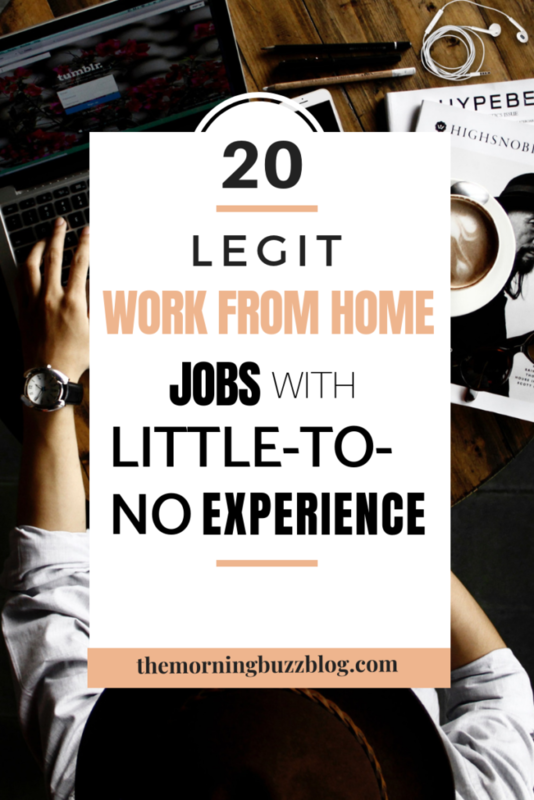 Whether you need extra cash or are trying to make ends meet, here are 20 work from home ideas to start earning money on your schedule. Blogging is a great way to earn some extra money. There are people who make $1 million or more a year from their blog! 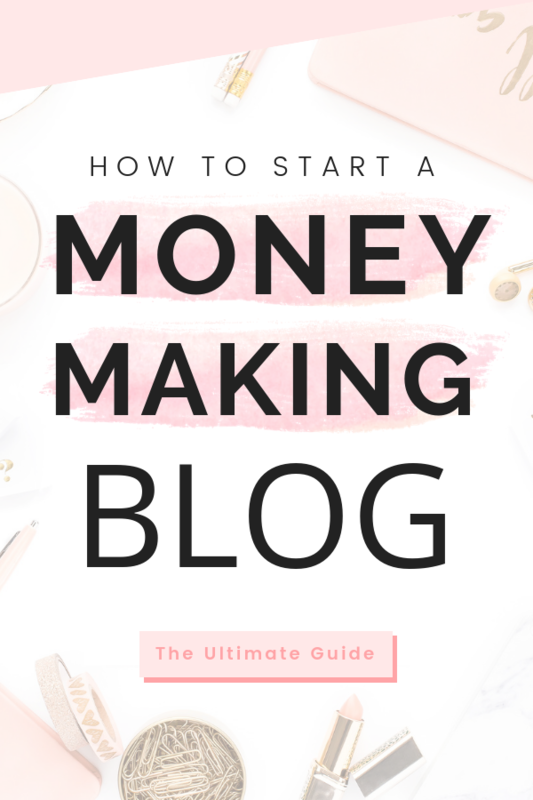 What I love about blogging is that it’s a creative outlet, you can work at my own pace and it can make you money. Affiliate Marketing: You put a referral link on your blog promoting a brand or service and when a customer signs up through the link then you receive a commission. Michelle Schroeder-Gardner of Making Sense of Cents makes over $50,000 a month from affiliate marketing! If you want to know how you can too, I’d suggest checking out her course, Making Sense of Affiliate Marketing. I’ve taken Michelle’s course and have already seen a significant increase in my income as a brand new blogger. The course is packed full of content, including bonus content and access to Michelle’s private Facebook group where you can ask questions and receive valuable information from a community of bloggers. If you have no idea what Affiliate Marketing is and want to learn more about it or you’re a blogger who wants to learn the best techniques to increase your income, check out Making Sense of Affiliate Marketing here. Advertisements: Companies will pay you to place their advertisements on your site. Note: If you go with this route then be careful not to have too many or else you may look spammy. Your Own Products: Create an e-course, e-book or other product and promote it on your blog. Sponsored Posts: Companies will pay you to promote their products. Note: If you go this route, make sure to promote products you actually love and use regularly. 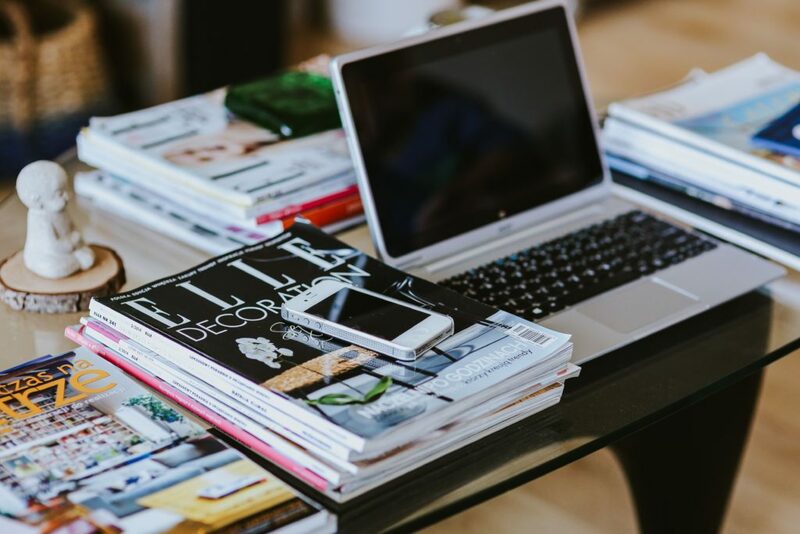 If you love writing and networking with people, then blogging is the best side-hustle for you! Selling printables on Etsy is a real work-from-home business that you can do from the comfort of your home. 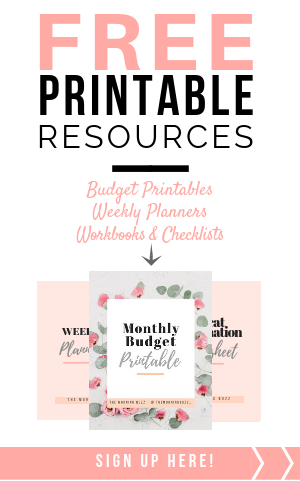 The type of printables you can make are endless – budget trackers, wedding invitations, inspirational signs, calendars and more. If you are looking for a fun, creative side-business to start, this is a good one to look into. You can make a good profit through Air bnb by renting out your apartment or house. If you have a vacant house or travel often than this is a great option for you. It’s a great way to earn passive income while you are away from home. How much money you earn depends on how much you charge and the length of time a customer stays, but it’s a great way to earn passive income. There are a variety of ways to make extra money on the side, and one of them is by becoming a virtual assistant. A virtual assistant does administrative tasks for a person or company (e.g. blog) from the comfort of their home. As a virtual assistant, you can assist with social media, create images, write content, answer emails, edit content, proofread and more. There are many tasks that you could be hired for and make between $18-$35 per hour, depending on your skills and level of experience. You can make money by selling products through Amazon’s Fulfillment By Amazon (FBA) program. How it works: You do research and find a product you want to sell. You ship it to Amazon who stores and processes the item. Then, you put the product up for sale on Amazon, and when a customer purchases it, Amazon ships it to them. To summarize, it takes a lot of the leg work out of having to ship items to customers yourself. There are people who have made millions selling on Amazon. It takes a lot of research and dedication, but it can be very profitable. This is probably the easiest side-hustle out there and if you take enough surveys, you can make a decent profit. About a year ago I was obsessed with taking surveys and was able to make extra money on a daily basis. Somedays I made $5 to $10 and other days I was able to make even more. Buying and selling blogs is a legitimate side business that can turn a good profit. 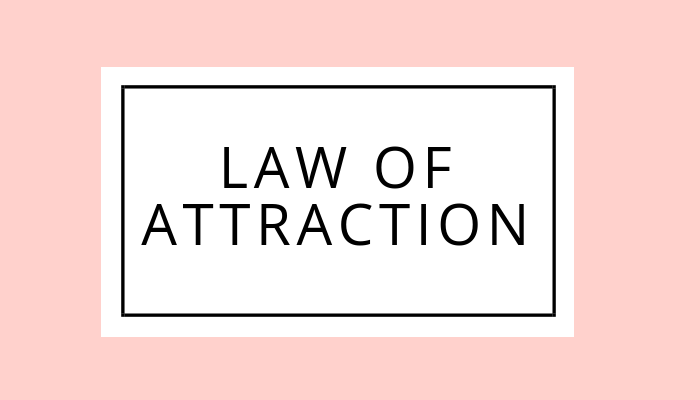 Basically, how it works is you build a blog up to be desirable by buyers (which means, you need advertising, affiliate links and sponsorships) and then you auction it off on a platform. It takes some time and a lot of learning, but it’s totally worth it. I’ve heard of people who sold theirs for $50,000 or more! With freelance writing, you get paid to write a variety of content for websites. You charge your own rates, which can increase as your experience and skills grow. You could write articles for blogs, content for websites, and much more. Also, you don’t have to be a flawless writer to be successful in this career field. Even though I am a journalist, I still make mistakes and have a lot to learn. 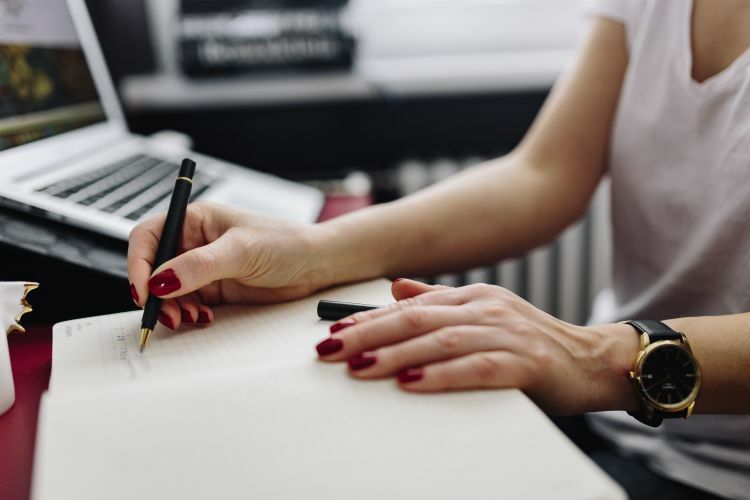 Your writing improves with practice, so if you decide to become a freelancer, make sure you’re dedicated to advancing your skills. This is one of my favorite side-hustles because it’s like treasure hunting and you can make a decent amount of money from it. I’ve heard of people making $30,000 or more reselling thrifted clothing and household items. It’s not too terribly difficult either, where the bulk is scouting products. “Flippers” generally sell their items on Ebay, Craiglist and Amazon, which generate a lot of traffic on a daily basis. Textbooks can go for a lot of money, sometimes $100 or more, which is why flipping them can be a great side-hustle. It involves going to thrift stores, finding cheap textbooks, using an app to find the listing price and selling them on a platform like Ebay, Criaglist or Amazon. Amazon is a great place to sell used books because they generate a lot of traffic every day, especially college students looking to buy textbooks for classes. I’ve heard of people making $6,000 a month from this side-business, so this can be a fun and profitable way to make some extra money. Transcriptionists turn digital media (audio and video) into text. They are constantly in high demand because there is always a person who needs someone to turn their audio or video into text — bloggers, writers, podcasters, online teachers—and you could earn up to $25 an hour or more. 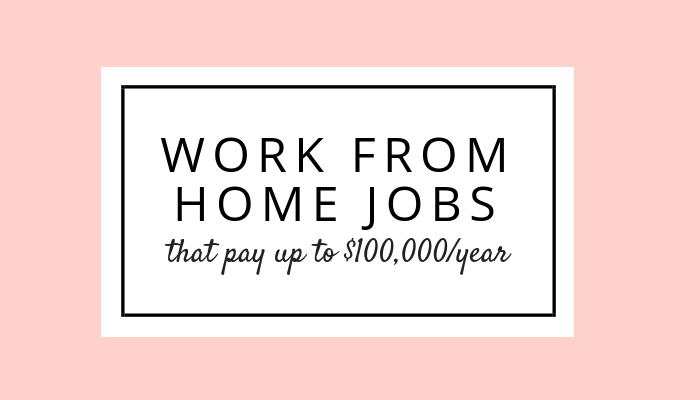 With this career path, you can set your own schedule and work however many hours you want each week from the comfort of your home. If you are looking for a new job or even just a side hustle, this may be something that you want to look into. You can create an entire freelance business by proofreading court transcripts, blog content or books. How much money you make depends entirely on how much you charge per page and how quickly (and accurately) you can proofread. If you become good enough at it, you could end up making up to $18 or more an hour. It takes time to learn and build a business out of it, but once you do, you can make a decent income. Caitlyn, from Proofread Everywhere, makes over $43,000 from proofreading in the comfort of her home. Now she teaches others how to also turn their proofreading talent into a successful business. If you want to find out how she makes a full-time income as a freelance proofreader, you can sign up for her FREE 76-minute workshop that will give you tons of useful information on becoming a professional proofreader. With the internet boom in recent years, social media managers are in high demand. Most businesses have a website and social media accounts to gain a bigger following, which is why hiring a social media manager is a necessity. There are a lot of benefits to this side-gig so it is worth looking into. Are you skilled at typing? If so, data entry may be the right job for you. A data entry clerk enters data into a computer system and performs other clerical services for online clients. Many online data entry jobs are paid by the number of correct keystrokes, so the faster you can accurately key data, the more money you’ll make. This is one of the most unique and easiest ways to make some extra cash. How cool would it be to get paid to try out a new website and provide feedback? With website testing, you can get paid up to $10 for each you participate in. Just be aware of scams, though. Express your creativity and share your knowledge by creating digital products. 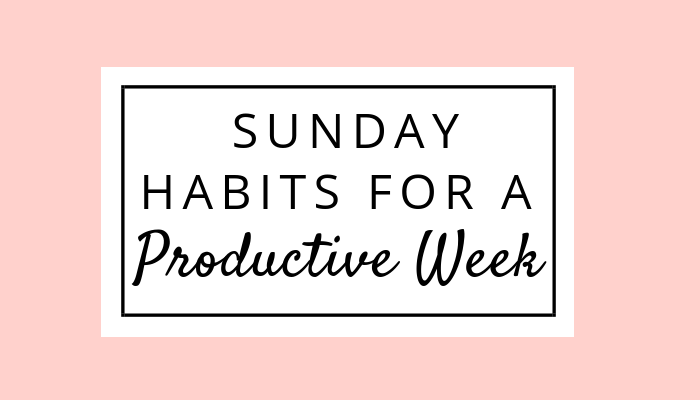 These can range from courses, ebooks, printables and more. With digital products, people can access them immediately and permanently store them for future reference. If you have a creative side, then this can be a fun way to earn some extra money. If you like teaching and helping people then this is the side-hustle for you. With online tutoring you could make between $14-$22 an hour depending on where you work. Do you have a knack for logo design, web design, editing or marketing? 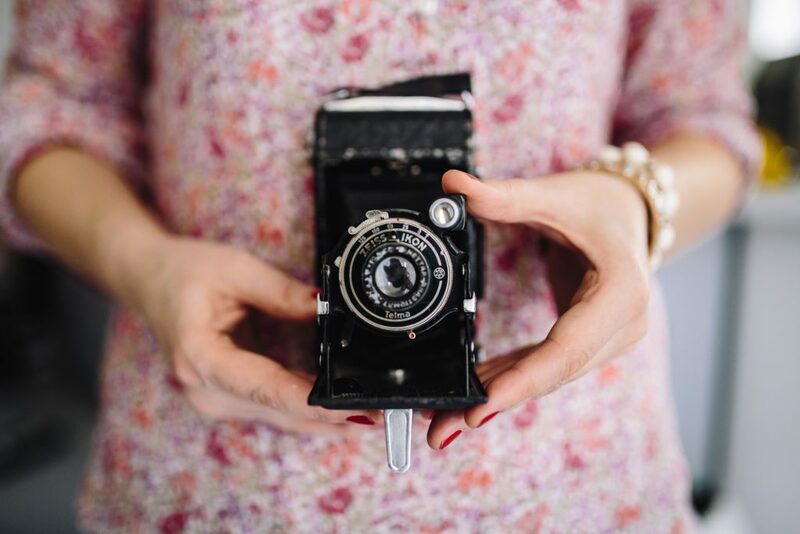 Do you want somewhere to showcase your freelance work? If so, there are plenty of websites that host your services and market them to customers. I know many bloggers who use sites like Fiverr to hire logo designers for their blogs. Logo and web designers are always in high demand and make a good profit, so this is a great side-hustle to get into. Are you fluent in multiple languages? Then becoming a translator might be the job for you. Translators are in high demand due to companies working internationally and you can make lot of money from it. There is always a business looking for someone to translate for them, so if that’s something you’re interested in, then I’d say go for it! As a search engine evaluator, companies like Google will give you information to search for, you tell them how closely their results matched what you were looking for and then you get paid for your findings. What’s really cool about this side-hustle is that you work on your own time and it pays up to $9 an hour or more!